A couple of weeks back, we released an audit log viewer on MyGet Enterprise. Administrators of a MyGet Enterprise plan can inspect every action that happens on their MyGet instance and see who did what, when, and where. The list of audit entries is searchable and can be exported to a CSV file so additional querying can be done in, for example, Excel. Details for each audit entry can be consulted and display the action that was performed, who performed it, and where it was executed. We can also see the location the user performed the action from, including the IP address (last octet always 0 for privacy reasons). With audit logs available on MyGet Enterprise, we are confident MyGet can help larger teams and enterprises with auditing and dependency lifecycle management. Good news everyone! We just shipped PHP Composer support on MyGet! If you are building PHP applications and libraries, you can now package them and add these to your MyGet feeds. We currently support almost all features we have available for other package managers. Of course you can upload your own packages (via the web UI as well as via a curl POST) or packages from upstream repositories like Packagist. Build services are supported as well: as long as there is a composer.json in your repository, we’ll run tests against it, package it up and make it available as a PHP Composer package on your Myget feed. Quite easy: head over to www.myget.org and sign in (or register). You can then create a feed and start adding packages. Our getting started documentation has some more details on how to upload your first PHP Composer package to MyGet. We’re really excited about introducing PHP Composer support on MyGet! You can now use MyGet to securely host and collaborate on NuGet, symbols and sources, Chocolatey, PowerShell, NPM, Bower, Maven, PHP Composer and VSIX packages. JetBrains just released a new .NET IDE: Rider. At MyGet, we’ve been using Rider for our internal development since it was announced. 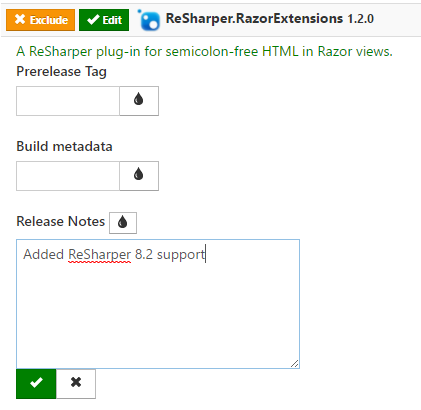 So far, we have really enjoyed this IDE built around ReSharper! 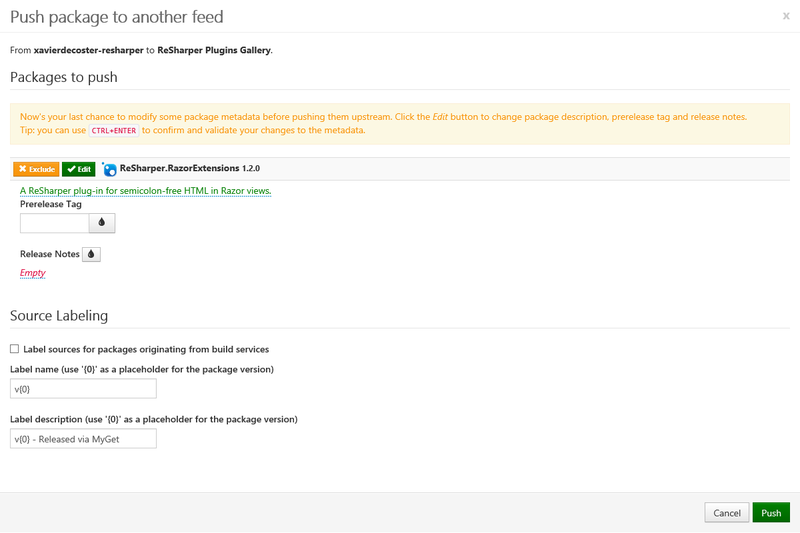 And since it comes with a lightning-fast NuGet client, let’s see how we can consume packages from a MyGet feed. 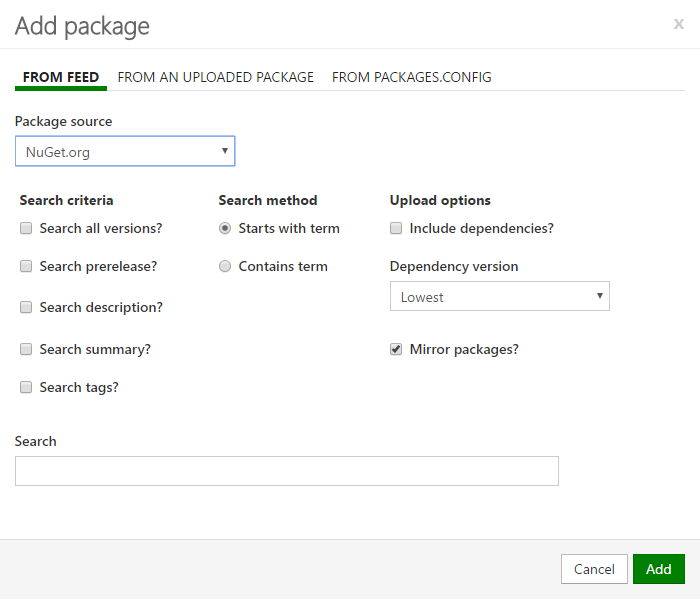 The first step in connecting Rider to a MyGet feed is adding it as a package source. We can do this using NuGet.exe (via good old NuGet.config), or from within Rider. 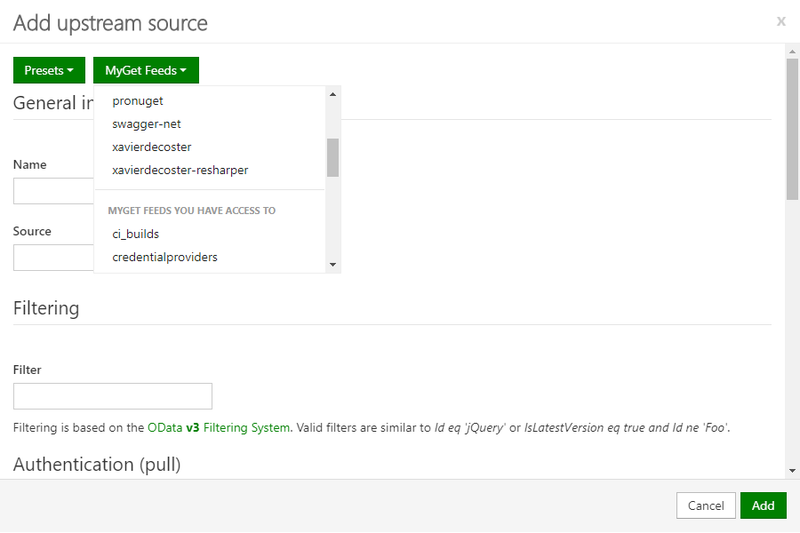 From the NuGet tool window, open the Sources tab. This will show us all of the NuGet configuration files that are in play, and a list of all feeds configured. From here, we can add our MyGet feed (or edit an existing entry). We will have to give our feed a name so we can easily recognize it in Rider, and the URL to our feed. This URL can be found on the MyGet feed details page after logging in to www.myget.org. 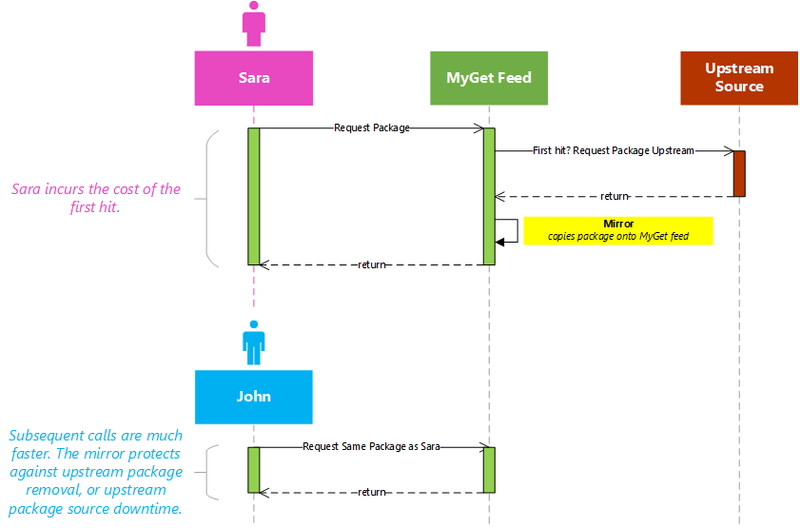 The NuGet client in Rider supports working with public and private MyGet feeds. While Rider supports using pre-authenticated feeds as well as feeds that require entering credentials, we recommend using the latter. Rider safely stores our MyGet username/password in its password store, which is based on KeePass. Using MyGet together with JetBrains Rider makes it possible to develop .NET applications and let your development team consume both public and private packages hosted securely on MyGet. Download Rider for Windows, macOS or Linux, and take it for a 30-day trial. Create a MyGet account to securely work with private NuGet feeds, and get a 14-day trial. The MyGet Gallery contains a collection of interesting feeds where open-source projects and software vendors share their NuGet, npm, Bower and VSIX packages with the world. Most often the packages in the gallery are nightly builds or preview versions, so we can keep our projects on the cutting edge of technology using the latest dependencies. We now display the feed’s README, where we render Markdown and the feed owner can provide additional information like links to GitHub, documentation and so on. Underneath, the list of packages on the feed is shown, including a description. We also added a search box so we can do a quick search across the packages listed on the feed. The top bar has a Connect to Feed button, which will provide connection details to, for example, connect to the feed from Visual Studio or npm. Have a look at the feeds in the MyGet Gallery, and let us know what you think using the comments below or via Twitter. As MyGet is a software-as-a-service leveraging a subscription model, we're transitioning our versioning scheme towards a format that is more understandable: YYYY.R. As such, these release notes comprise our first milestone of 2017, hence the version number 2017.1. The MyGet 2017.1 milestone was tagged on June 1st, 2017. MyGet again adds some new functionality to the service. The following are the major highlights of this milestone. 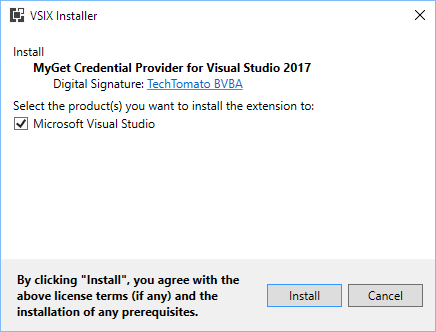 We've built a MyGet Credential Provider for Visual Studio 2017! This extension allows you to authenticate against your MyGet feeds using OAuth. Install it from the Visual Studio Gallery! We've built a web utility to help you learn and adopt Semantic Versioning: check out our MyGet SemVer Explorer! Security: we've built a MyGet Credential Provider for Visual Studio 2017! This extension allows you to authenticate against your MyGet feeds using OAuth. Security: we've consolidated the login page: one page to rule them all! Please tell us how we're doing by taking 10 seconds of your time to answer a single question (and optionally provide any feedback you want). We love hearing from you, so keep that feedback coming! MyGet is built for you! Upstream sources play a key role in a professional approach towards Package Management. 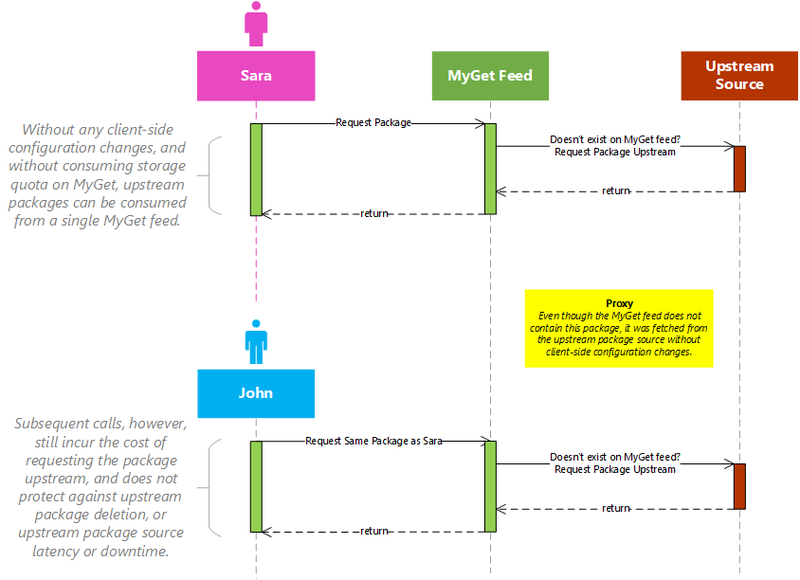 MyGet gives you the option to specify one or more upstream sources for a package feed. Even though this feature has been available on MyGet for years now, we feel it upstream sources deserve a place in the spotlight once: they enable various scenarios that are impossible on any other package management service, and above all: they are a huge facilitator for a smooth and automated development workflow (and thus developer happiness :-)). Upstream sources make it very easy to pull in packages from other package sources onto your downstream MyGet feeds. Any configured upstream source on your MyGet feed will be made available to you in MyGet Build Services, without having to commit any secrets such as credentials or API keys in your source repository. If you're using NuGet: no need to create a nuget.config file! If you are confused about the usage of "upstream" and "downstream" in the context of package sources, we've got a little poetic explanation for you, which may already help you visualize the relationship between package consumers, your MyGet feeds, and your feed's upstream sources. Consider the direction in which packages are flowing from a given package source to an ocean of consumers.Your package may have dependencies "upstream", to packages on another feed. From the point of view of those dependencies, the depending package is located "downstream". When a user consumes the downstream package, it will also fetch the upstream dependencies.The consumer, however, is only allowed to fetch or query those upstream packages if the feed being queried (downstream) is also configured to proxy (or mirror) the upstream package source. A dialog will prompt your for upstream source information and will also expose a few common presets for you to take advantage of. Did you know we even support Dropbox?! If you have any access privileges to other MyGet feeds, you will see those in the MyGet Feeds presets, so you can easily build a chain of package sources to facilitate a package promotion flow. If you select a private MyGet feed you have access to as an upstream source, there's no need to provide credentials to be able to restore packages from it on MyGet Build Services. MyGet will impersonate your user account when authenticating against that upstream source. For any non-MyGet upstream source that requires authentication to pull packages, you'll have to provide username and password to be used during Basic Authentication. Mirroring: the package metadata and the package itself are copied onto the MyGet feed. When querying the package, we server the package directly and don't use the upstream source. Mirroring of a package version happens upon the first request for that given package version. Warning! Avoid configuring multiple package source proxies on a single feed, or in a chain of feeds, as this will magnify the disadvantages, and result in very slow feed response times. To enable upstream source proxying, you must tick the check-mark next to Make all upstream packages available in clients. To enable upstream source mirroring, you must tick the check-mark next to Automatically add downloaded upstream packages to the current feed (mirror). Optionally, you can also tick the third check-mark to indicate that any package found upstream is to be considered a package dependency (and should not be consumed directly). This will hide those packages from search results, whilst still allowing you to restore them. The API key for an upstream source is also made available during the build process. This means during a build, you can call into nuget.exe push and push packages to configured upstream sources. When adding or editing a upstream source, we can enable this behaviour per package source, as well as an interval when MyGet should check for updates. Include prerelease versions: By default, MyGet will only consider stable packages. When enabled, we will also check pre-release packages from the upstream source. Automatically update packages to their latest versions: Enables the behavior of automatically updating packages from the upstream source. As you can see, MyGet's support for upstream package sources unlocks a wide range of package management scenarios that may help you streamline your development flow and package governance even more. If you haven't tried the above scenarios yet, do give them a try and experience how it may make your life easier. Oh, and we do support pushing your private symbols packages upstream along with your NuGet packages, too! PS: Please take 10 seconds of your precious time to tell us how we're doing! Another month, another episode of MyGet's NuGet and NPM news from the community! We'll look at some interesting blog posts and articles found on the Internet, curated by our MyGet founders Xavier and Maarten. Follow @MyGetTeam on Twitter for more! Note that this will be the last episode of our monthly news for now. Let us know if you'd like to see this series continue! The NuGet team is considering improving package identity and trust by allowing to verify accounts and reserve package prefixes. For example, System. * could be reserved for the .NET Foundation so consumers always know the package comes from a thrustworthy source. Good read, good thoughts! Naeem Khedarun built a tool that scans of outdated packages. NuGetXray, as the tool is called, helps identify outdated packages and can visualize this in a nice report (which can be included in a TeamCity build). More tools! Maarten blogged about extending .NET CLI with custom tools, with an example tool dotnet init that initializes your NuGet package metadata. MORE TOOLS! Alistair Chapman is introducing the Cake Build Systems Module which gives CI superpowers. For example on MyGet Build Services it will use service messages to add additional tracing to the build log. On TeamCity, the currently running build task is displayed. And more - give it a go! A GitHub PR was opened, discussing npm@5 and what will be included. Work in progress! Axel Rauschmayer blogged about setting up multiplatform npm packages. In an example, he describes creating a package that targets ES5+, ES6 and webpack at the same time. As a Microsoft developer, I was excited for .NET to solve the nightmares of dll hell. It did… but has since created a new problem: package hell. 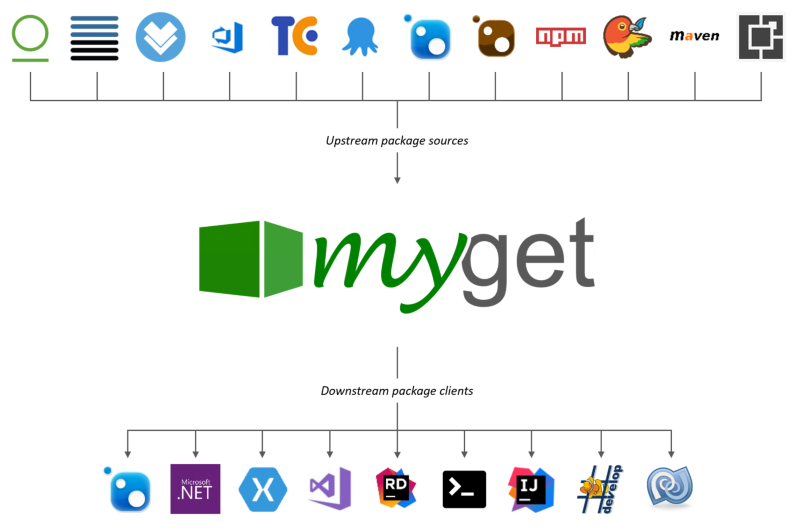 MyGet helps solve some of the challenges of NuGet. MyGet has been a big help for my team and can probably help yours, too! At Stackify, we use MyGet for a few different reasons, which we will cover in this post. You may have heard of us via our awesome & free .NET Profiler, Prefix, or our APM solution, Retrace. We started playing with .NET Core when it was in the early betas. At that time, the only way to get the latest versions of .NET Core nuget packages was via the MyGet package feed. Things were rapidly changing and we were constantly trying to keep up with what the .NET community was releasing. As you can imagine, Microsoft does not ship daily builds of every .NET framework library to NuGet for everyone to access. They only release thoroughly tested and reviewed updates. Between those updates they can use MyGet to get pre-release versions to their beta testers. They could publish pre-release versions to NuGet, and sometimes they do. 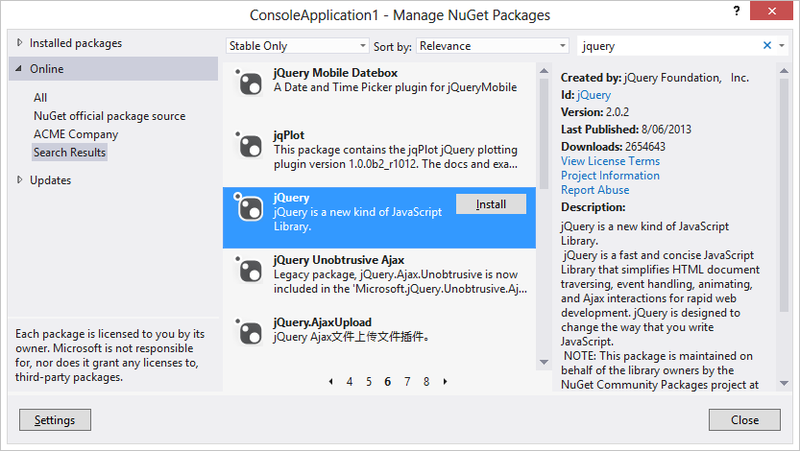 Publishing pre-release version to NuGet also broadens who has access to the packages. By putting them on MyGet, it keeps the casual developer from downloading beta versions and having lots of problems. MyGet is a great solution for publishing daily builds of your packages. You can then tell your power users how to access them. At Stackify, we can do the same sort of process to internally test new versions of our packages before we give them to our clients or air our dirty laundry on NuGet. At Stackify, we have several projects that are shared across multiple applications. We have elected to split out some of these projects in their own source code repositories. It helps us keep our repo size(s) down and also helps enforce some good practices around changing shared dependencies. NuGet packages are the preferred way to share those class libraries across applications. Since the code is for internal purposes, MyGet’s private package feeds are a great solution for us. 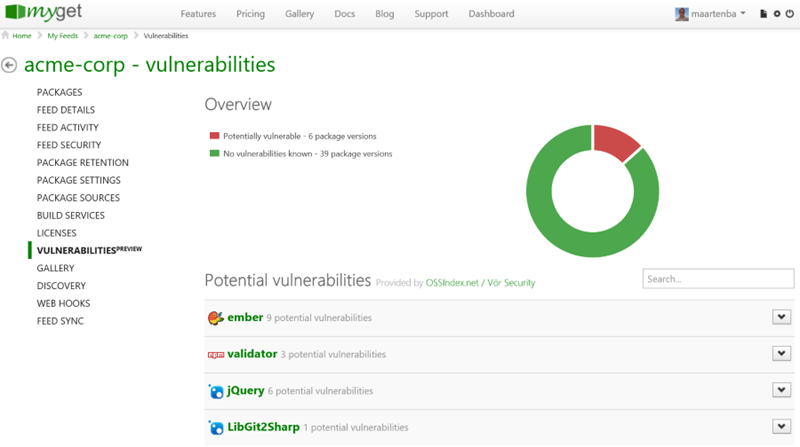 It provides a secure way to use NuGet packages. We created a build and deployment process up in our Bamboo build server for the projects. After we check in our code, we manually kick off a build and it will take care of building the code and publishing a new package to MyGet for us. After the shared packages are updated on MyGet, we can update the applications that use those shared packages. One of our applications requires that we use tools like WinDbg to regularly analyze crash dumps. To do this, we need the debug symbols from our projects. For security reasons, we don’t ship our debug symbols anywhere. Trying to keep track of the matching debug symbols for every version of our class library is a nightmare. We solved this problem by always publishing a package that includes the debug symbols to our private MyGet package feed. Now anytime we need to use WinDbg, we can point our symbol source at MyGet and WinDbg automatically retrieves the debug symbols from MyGet. It is almost magical! This also works well for debugging the libraries we have pulled out into their own repos as shared dependencies. It allows developers to test their package but still step through the code. Thanks for the story, Matt! Make sure to check out both Stackify and MyGet! Guest post by Matt Watson. Matt is the Founder & CEO of Stackify. He has been a developer/hacker for over 15 years and loves solving hard problems with code. While working in IT management he realized how much of his time was wasted trying to put out production fires without the right tools. He founded Stackify in 2012 to create an easy to use set of tools for developers.